After the near disaster from the Phollywog and semi-recovery with Designer Rex, the Toywerks toy company had finally began to recover its public image (and quarterly profits.) The decision was made to venture into one more attempt at the designer pet market. This time all manner of safety precautions were taken. 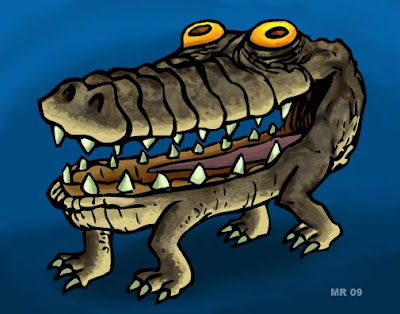 Although the Gatorhead uses alligator DNA, it is altered enough that the animal is a natural herbivore. Gaotrheads are born sterile and have a predetermined 4 year life span. They have been manipulated to never grow beyond the size of a small dog and are thus completely safe for children. It was also a huge failure. Customers found the pet slow moving, lethargic, and "boring." Despite all manner of built in fail safes, sporadic reports of Gatorheads breeding and growing to full alligator adult size are common.